After EBC, we have yet another highlight… to climb Island Peak (6,189m). This mountain is one of the main trekking peaks in the region, with a remarkable and decidedly glaciated West Face that ascends from the Lhotse Glacier. The mountain was named ‘Island Peak’ in 1952 due to its striking location in the middle of the Chukung valley – like an island in a sea of ice. Island Peak, also known as Imja Tse peak, is an extension of the ridge that comes down from the south end of Lhotse Shar, situated merely 10km from Mount Everest. Island Peak climbing offers an excellent opportunity to climb an exhilarating Himalayan summit to top off your earlier trekking trip. The magnificent summit views are certainly a fitting reward for your efforts as you will behold sights not possible from trekking. This trip is not easy and the climb itself is physically challenging, but not technically difficult. 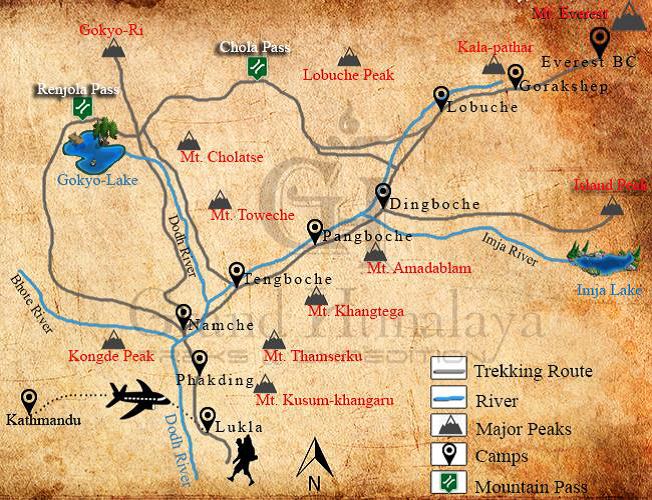 We’ll have back-to-back days of trekking at high altitude, sometimes over rugged terrain. We expect all trekkers to have a high level of fitness so they can deal better with the altitude and the physically demanding nature of the trek. Our itinerary is tried and tested and includes multiple acclimatization and rest days along the way. However, we can’t predict how each team member will react to the altitude so we ask that all participants come well prepared for the demand of this trek (which means you need to train!). At The Altitude Gym, we will have a great opportunity to pre-acclimatize and all trekkers must commit to an agreed training program to make our collective journey a success. From Lobuche, we’ll trek down to a densely populated village called Dingboche, which is the highest place in Asia after Tibet to grow barley. After two hours of easy descend to Dingboche, it’s a gentle uphill of around 2 hours to reach today’s destination of Chukung. Today is another short trek of four hours to the Island Peak Base Camp. From today, accommodation will be in tents for the next two days with food prepared by our professional chef. Overnight at tented camp. After breakfast, we pack all our camping gear and climb towards the high camp taking about two to three hours of walking. The trail goes steeply and turn left to the hillside. After reaching the top of the hill, we go through a steep rock way to reach our camp for the night. Like every expedition, summit day is the most important and adventurous day of the trip. Depending on the weather, we’ll start our climb in the morning through the several short rock steps to emerge on the right side of the gully. We then follow the ridgeline, leading to an exhilarating and exposed traverse onto the snout of the summit glacier. From here, we’ll rope up as we have to go through several crevasses. We follow the snow and ice-slope, where the guides will fix the ropes, and this leads to the top of the peak. The view of the entire Chukung valley, the rapidly growing Imja Lake, the north face of Ama Dablam, and the gigantic Mt Makalu can be viewed from the summit, which is simply astounding. After taking the requisite summit photos, we descend all the way to Chukung for an overnight at the lodge.